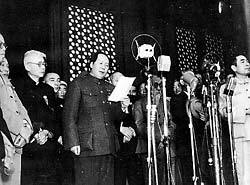 On October 1, 1949 a grand ceremony was witnessed by 300,000 people in Beijing's Tiananmen Square, and Mao Zedong, chairman of the Central People's Government, solemnly proclaimed the founding of the People's Republic of China (PRC). During the initial post-Liberation period, the Chinese government successfully carried out land reform in areas accounting for over 90 percent of the total national agricultural population, and 300 million farmers were granted approximately 47 million ha of land. Amazing achievements were made during the First Five-Year Plan period, from 1953 to 1957. The average annual increase rate of the national income reached over 8.9 percent. China established basic industries necessary for full industrialization hitherto non-existent domestically, producing airplanes, automobiles, heavy machinery, precision machinery, power-generating equipment, metallurgical and mining equipment, high-grade alloy steels and non-ferrous metals. The ten years from 1957 to 1966 was the period in which China started large-scale socialist construction. Though China suffered from the mistakes in its policies during the period, it also accomplished a great deal. The nation's total industrial fixed assets quadrupled between 1956 and 1966 and the national income increased by 58 percent in constant prices. The output of essential industrial products increased by several or even a dozen times. Large-scale agricultural capital construction and technical transformation got underway. Unfortunately, the "cultural revolution," which lasted for ten years (May 1966-October 1976), made the state and its people suffer the most serious setbacks and losses since its founding. The Jiang Qing counter-revolutionary clique was smashed in October 1976, marking the end of the "cultural revolution," and the beginning of a new era in Chinese history. The CPC reinstated Deng Xiaoping, previously general secretary of the CPC, in all the Party and governmental posts he had been dismissed from during the "cultural revolution." In 1979, China instituted a guiding policy of "reform and opening to the outside world" under Deng's leadership, and the focus was shifted to modernization. Major efforts were made to reform the economic and political systems. China was step by step establishing a road with Chinese characteristics, a road that would lead to socialist modernization. Profound changes have come about in China since the country embarked on the policy of reform and opening-up. The situation in the country is the best ever, characterized by a swiftly and vigorously advancing economy and markedly improved living standard. Jiang Zemin, general secretary of the CPC Central Committee and president of the state, is leading China's third-generation leaders to uphold and carry on the policy of reform and opening-up initiated by Deng Xiaoping, and as a result, China enjoys a stable political situation, burgeoning economy and active diplomacy, winning the support of the broad masses of the people.